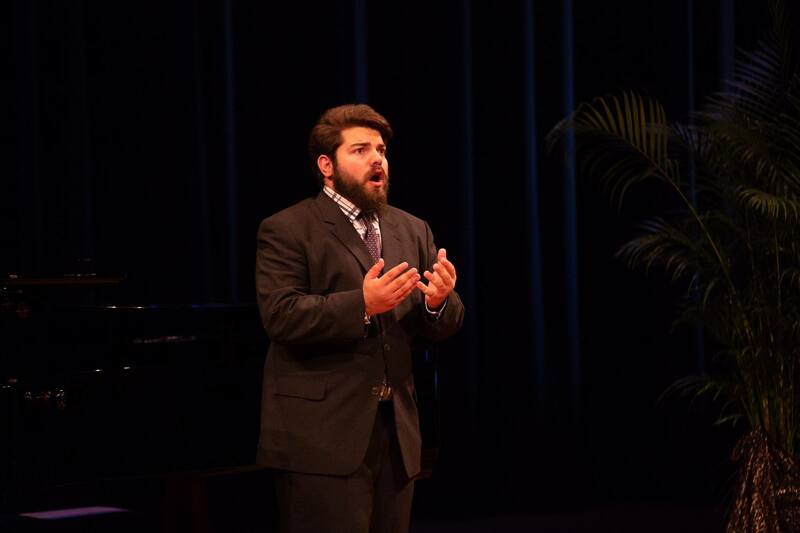 CSUN music student Matthew Soibelman, pictured here at the 2018 James Toland Vocal Arts Competition, found a love for opera that has led him to many successes.. Photo courtesy of Matthew Soibelman. Whilst at college, his voice was getting lower and lower, and friends were telling him he should go into broadcasting. He tried it out by hosting a weekly college radio show, but realized that long days spent alone in a radio booth wasn’t for him. He wanted something more social. Then Soibelman discovered his parents’ old Sinatra vinyl. The music and singing style were captivating. Maybe singing jazz could be his thing. It wasn’t, according to the vocal teacher he hired from the LA Opera. Though he started his singing career fairly late, Soibelman has experienced great success at regional and national singing competitions over the past three years. He often competes against singers from prestigious graduate schools, as was the case in the American Vocal Arts 2019 International Opera Championship, where Soibelman finished as a finalist. ​Soibelman’s unique voice has also landed him jobs at Disneyland and on blockbuster movies. When Soibelman decided to pursue his newfound passion, he choose to pursue undergraduate studies at Pepperdine, but later transferred to CSUN after being drawn to the performance opportunities in its Music Department and the surrounding area. Another big pull was the department’s vocal professors, he said. Early in the fall of 2018, Soibelman came across the American Vocal Arts 2019 International Opera Championship on a website for vocal competitions. Having participated in previous online competitions, he already had his audition recordings ready and figured he would give it a shot. It certainly paid off. After months of no communication from the competition, Soibelman had forgotten all about it when he one day in November received the email announcing him as one of the finalists. Placing as a finalist was certainly an exciting experience as he was up against contestants from prestigious international music schools. The International Opera Championship isn’t the first time he’s been recognized. In 2018, Soibelman was honored as the first recipient of the Matsumoto-Stark Vocal Performance Scholarship by CSUN’s Department of Music, and he had previously won several competitions and scholarships nationwide. Despite his many successes, Soibelman still gets surprised when he beats singers from some of the nation’s best vocal graduate programs. Aside from school and competitions, Soibelman has also found the time to work on projects such as caroling with the Goode Time Carolers at Disneyland during the holidays. Thanks to industry connections, he also recorded vocals for the scores of major motion pictures Star Wars: The Force Awakens, Star Wars: The Last Jedi and Transformers: The Last Knight. Taking a break from competitions, Soibelman is now focusing his time on working on his senior recital and rehearsing for the two operas performed by the CSUN opera program this spring. After graduating this upcoming May, Soibelman plans to take some time off to focus on his personal vocal training before auditioning for graduate programs. His goal is to attain an Artist Diploma — similar to a Master’s degree but focused on performance rather than theory — before pursuing an operatic solo career. Soibelman describes the road to an operatic career as long and winding, but with the many successes in a profession he just sort of fell into, he is more than ready to work his way there. “It’s easy to start singing — everyone does it in the shower or in the car — but technique-wise, I don’t think it ever ends. It’s a never ending process. And I just like the thrill of it,” he said.